Our family is different. I have not realized that as much as I have since we brought our daughter home in December. We no longer fit into the category of “normal”. I mean we were abnormal when we had more than 2 kids and when we adopted a baby of a different race who has some special needs, but we are way over toward weird now. Joshua’s special needs are not all that evident. Most people assume he is a year younger than he is, since he is tiny, and that he is really quiet. (hahaha, if you only knew). Anyway, just looking at us, we look like a family who adopted a normal African-American little boy. Honestly, that is becoming much more acceptable and common. It’s not unusual to find a family with a child of another race in the mix. 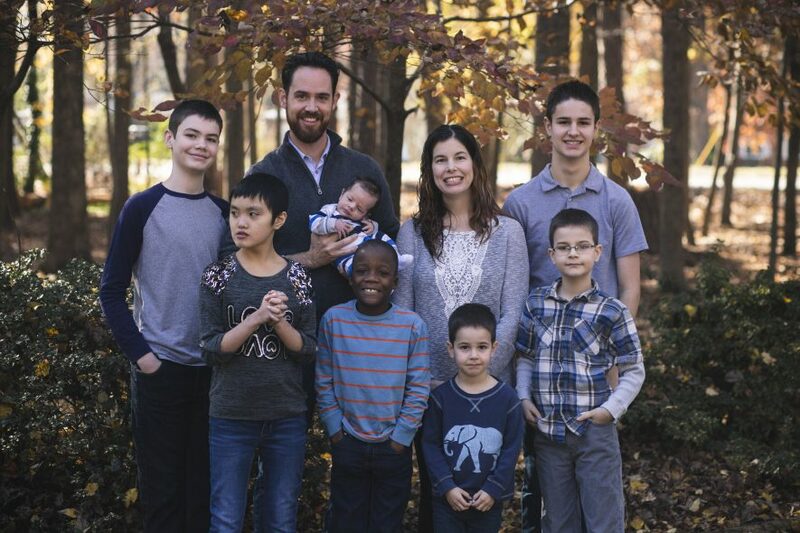 But now that we have 5 kids, that makes us weird and then on top of that Elizabeth’s special needs are pretty evident when you see us walking down the street. We are just not your average family. That is okay with us. We planned it that way. We knew what we were getting ourselves into. Okay, so we had some idea, you can’t really know until you do something what it will really be like, but anyway. What I didn’t realize was how much it would change us. It changes the way you feel and the way you are able to function as a family. We can’t do things most families can do, like go to a lot of public places. We have to think ahead about where we go to makes sure everyone in our family will feel comfortable there and not be a hinderance to other people. For example, the movie theater would never work for us, at least not right now. I feel out-of-place at most places we go. I feel stared at and it’s not always easy to be there. We have yet to eat out anywhere but McDonald’s, because Elizabeth has such issues with space and eating, that it would be impossible. We are finding our new normal. Our new normal, we are discovering, needs to be more simple than our old normal. There are some things we have been involved in that we are finding we cannot be involved in anymore, because they don’t work for our family anymore. Organized stuff, like sports and clubs, are not possible right now for Elizabeth to attend, so we have to limit our involvement as a family. We could split up and do things separately, but that is not how we like to roll. We do things together, I think that is important. So, we find that we need to redefine our activities and business. It’s not a bad thing. I think we could all be less busy and be better for it. I don’t want to spend my life running around to sports and clubs and school functions every night of the week. That leaves you no time for family, and what is the point? I refuse to do that. So, this new member of our family has forced us into some good decisions, I feel like, but not ones that the average family has to think about most of the time. I sometimes feel like a bad parent with my kid’s school because I don’t make it to all the school functions. I have four kids in two schools and it’s just not possible. Nor would I do it all even if I could. I make it to the really big stuff, but I just can’t do it all. As I said, I could spend every night of the week doing something school or activity related, but I am not going to. I now understand why so many larger families home school their kids, it’s partly to simplify their lives. I get it. In fact, we have decided to not do preschool this fall with our youngest just to eliminate one more carpool. I know that not putting my three-year old in preschool is, in this day and age, a shock and craziness, but I am trying to simplify my life. Driving around all day to drop off and pick up five kids at three or more schools is not my idea of simple. Each family has to make their own decisions about how they will live their lives, but what I have discovered is that it seems as though we all get on this merry-go-round of craziness and then never stop to realize we could just get off. So many families are so busy running here and there and complaining about how they never have time as a family since they are so busy all the time. Well, I would ask who made you so busy? Society makes you believe you need to have your kids involved in sports and clubs and music practices so they will be “well-rounded” and “normal”. I disagree. I think teaching them that family is the more important than activities would be the better lesson. If your kids are spending 90% of their day being taught how to do math and play soccer by other people, what are they learning from you? We as parents should be the greatest influence in our kids lives, but how can we do that if we aren’t ever with them? I respect and admire your stance. While I enjoy taking H to her extracurricular activities and I love what she’s taking away from it, I had to learn to limit myself. She would be involved with everything if time and money allowed. One important realization over the last couple years…To be a good mom, I do not have to be involved in everything she does. I don’t have to go on every field trip. I don’t have to be super volunteer mom. In fact, I have found the importance of letting some things just be her thing. Perhaps it’s because my own mother wasn’t very involved. Or maybe it’s because she’s my only one. Or it could be tied to the “working mom guilt”. At any rate, I learned the value of stepping back, simplifying & just being there for her. I wouldn’t trade our one on one time going to games, practices, or shows for anything, but we don’t have to be doing something ALL the time. I’ve always been very grateful that my parents limited my extracurricular activities. We were each allowed 2 (mine were choir & Scouts, and then later Vibes & dance). Of course, with 4 of us, we were still plenty busy, but it could have been so much crazier! Right now, since my kids are still fairly young, they have 1 extracurricular activity each. E has story hour at the library, and A is on the kids’ worship team at church. For now, that’s plenty, and we love to bask in all the family time we have. You’ll probably look back on this next year with Elijah as a really special time! Hear, Hear! I agree. It is important for everyone to find their balance and not let family time get lost…but also not stay as an island unto themselves either. We need each other and community!